Namewee is the famous C pop artist produced by Cool Japan TV inc’s general planning division. Namewee collaborated with famous YouTubers from all over Asia and Japanese traditional dancers to produce the video “Tokyo Bon 2020” (Tokyo Bon Odori 2020). This video features individuals from a range of nationalities performing the traditional Japanese Bon Odori dance. After just 2 months of its release, the YouTube video was watched over 10 million times. 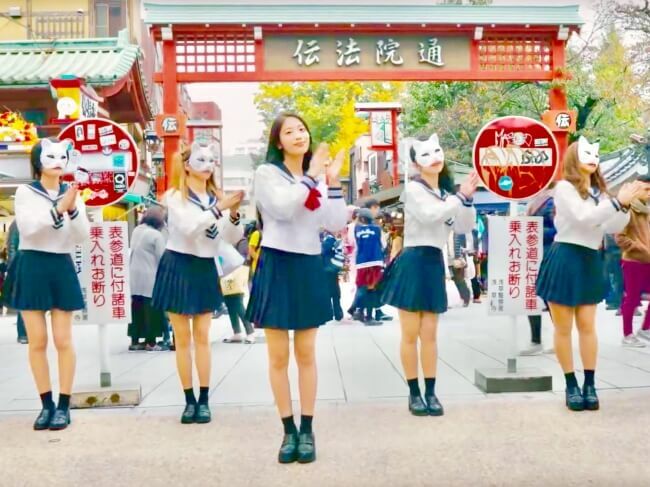 The video was also uploaded to many other platforms across the world such as Facebook, Instagram, Twitter, Weibo, Miǎo pāi, Měi pāi, Youku, bilibili and 9GAG, causing the views to erupt to over 100 million. One after the other, people from all over the world uploaded videos of themselves attempting the Bon Odori dance, creating a social phenomenon. The video also went viral in Japan. Already over 20,000 covers of the dance have been posted via the app “Tik Tok”, which is popular amongst the young generation. High School girls got particularly involved in this. The video is a catchy pop song featuring a Japanese high school student who says random Japanese words that sound like English words (Japanglish) to introduce tourist sites in Japan and traditional Japanese culture to Namewee the tourist and other foreigners who cannot understand Japanese. The climax of the song was set in a sumo ring where famous YouTubers from all over Asia and traditional Japanese dancers are wearing costumes associated with Japan such as Oiran dancers, Renjishi dancers, a sumo wrestler and ninja. This humorous music video captures the Japanese spirit in the face of the Tokyo 2020 Olympics, raising excitement further. Take a look at the video and try the dance for yourself!